Painting by John Trumbull of General George Washington Resigning His Commission as commander-in-chief of the Continental Army, at the Maryland State House on State Circle in Annapolis on December 23, 1783, after the end of the Revolutionary War and the ratification of the Treaty of Paris. Then Province of Maryland had been a British / English colony since 1632, when Sir George Calvert, first Baron of Baltimore and Lord Baltimore (1579-1632), received a charter and grant from King Charles I of England and first created a haven for English Roman Catholics in the New World, with his son, Cecilius Calvert (1605-1675), the second Lord Baltimore equipping and sending over the first colonists to the Chesapeake Bay region in March 1634. The first signs of rebellion against the mother country occurred in 1765, when the tax collector Zachariah Hood was injured while landing at the second provincial capital of Annapolis docks, arguably the first violent resistance to British taxation in the colonies. After a decade of bitter argument and internal discord, Maryland declared itself a sovereign state in 1776. The province was one of the Thirteen Colonies of British America to declare independence from Great Britain and joined the others in signing a collective Declaration of Independence that summer in the Second Continental Congress in nearby Philadelphia. Samuel Chase, William Paca, Thomas Stone, and Charles Carroll of Carrollton signed on Maryland's behalf. Although no major Battles of the American Revolutionary War (1775-1783) occurred in Maryland itself (although the British Royal Navy fleet passed through and up the Bay to land troops at the " Head of Elk"), to attack the colonies' capital city, this did not prevent the state's soldiers from distinguishing themselves through their service. General George Washington counted the " Maryland Line" regiment who fought in the Continental Army especially the famed " Maryland 400" during the Battle of Brooklyn in August 1776, outside New York Town as among his finest soldiers, and Maryland is still known as "The Old Line State" today. During the war itself, Baltimore Town served as the temporary capital of the colonies when the Second Continental Congress met there during December 1776 to February 1777, after Philadelphia had been threatened with occupation by the British "Redcoats". Towards the end of the struggle, from November 26, 1783, to June 3, 1784, the state's capital Annapolis, briefly served as the capital of the fledgling confederation government (1781-1789) of the United States of America, and it was in the Old Senate Chamber of the Maryland State House on State Circle in Annapolis that General George Washington famously resigned his commission as commander in chief of the Continental Army on December 23, 1783. It was also there that the Treaty of Paris, which ended the Revolutionary War, was ratified by the Confederation Congress on January 14, 1784. Like other states, Maryland was bitterly divided by the war; many Loyalists refused to join the Revolution, and saw their lands and estates confiscated as a consequence. The Barons Baltimore, who before the war had exercised almost feudal power in Maryland, were among the biggest losers. Almost the entire political elite of the province was overthrown, replaced by an entirely new political class, loyal to a new national political structure. The State of Maryland began as the Province of Maryland, an English settlement in North America founded in 1632 as a proprietary colony. George Calvert, 1st Baron Baltimore (1580–1632), wished to create a haven for his fellow English Catholics in the New World. After founding a colony in the Newfoundland called " Avalon", he convinced the King to grant him a second territory in more southern temperate climes. When George Calvert died in 1632 the grant was transferred to his eldest son Cecil. The ships The Ark and The Dove sent by Cecil Calvert, 2nd Baron Baltimore (1605–1675), landed on March 25, 1634, at Blackistone Island, thereafter known as St. Clement's Island. Here at St. Clement's Island, led by Father Andrew White, they raised a large cross, and held a mass. In April 1634, Lord Baltimore's younger brother Leonard Calvert, first colonial governor, made a settlement at what was named "St. Mary's City". Although Maryland was an early pioneer of religious toleration in the British colonies, religious strife among Anglicans, Puritans, Roman Catholics, and Quakers was common in the early years, and in 1644 Puritan rebels briefly seized control of the province. Diagram of a slave ship from the Atlantic slave trade. From an Abstract of Evidence delivered before a select committee of the House of Commons of Great Britain in 1790 and 1791. Despite early competition with the colony of Virginia to its south, the Province of Maryland developed along lines very similar to those of Virginia. Its early settlements and populations centers tended to cluster around the rivers and other waterways that empty into the Chesapeake Bay. Like Virginia, Maryland's economy quickly became centered around the farming of tobacco for sale in Europe. The need for cheap labor to help with the growth of tobacco, and later with the mixed farming economy that developed when tobacco prices collapsed, led to a rapid expansion of indentured servitude and, later, forcible immigration and enslavement of Africans. In the later colonial period, the southern and eastern portions of the Province continued in their tobacco economy, heavily dependent on slave labor, but as the revolution approached, northern and central Maryland increasingly became centers of wheat production. This helped drive the expansion of interior farming towns like Frederick and Maryland's major port city of Baltimore. After the war, few of the enormous debts owed by the colonists would ever be repaid. Maryland planter Charles Carroll of Carrollton was the only Roman Catholic to sign the Declaration of Independence. One of the early voices for independence in Maryland was the wealthy Roman Catholic planter Charles Carroll of Carrollton. In 1772 he engaged in a debate conducted through anonymous newspaper letters and maintained the right of the colonies to control their own taxation. As a Roman Catholic, he was barred from entering politics, from practicing law, and from voting. Chase: "We have the better of our opponents; we have completely written them down." Carroll: "And do you think that writing will settle the question between us?" Chase: "To be sure, what else can we resort to?" From 1774 to 1776, Carroll was a member of the Annapolis Convention. He was commissioned with Benjamin Franklin, Samuel Chase and his cousin John Carroll in February 1774 to seek aid from Canada. He was a member of Annapolis' first Committee of Safety in 1775. In early 1776, while not yet a member, the Congress sent him on a mission to Canada. When Maryland decided to support the open revolution, he was elected to the Continental Congress on July 4, 1776, and remained a delegate until 1778. He arrived too late to vote in favor of it, but was able to sign the Declaration of Independence. It is possible that the First Amendment to the United States Constitution - guaranteeing freedom of religion - was written in appreciation for Carroll's considerable financial support during the Revolutionary War. Carroll was the only Roman Catholic to sign the Declaration of Independence, and until his death in 1832 he was its last living signatory. 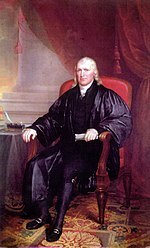 Samuel Chase, firebrand revolutionary and later a justice of the United States Supreme Court. Samuel Chase (1741–1811), was a "firebrand" states-righter and revolutionary, and was a signatory to the United States Declaration of Independence as a representative of Maryland. He co-founded Anne Arundel County's Sons of Liberty chapter with his close friend William Paca, and led opposition to the 1765 Stamp Act. Later he became an Associate Justice of the United States Supreme Court. Public opinion in Maryland before the war was bitterly divided; many Marylanders either actively supported the Crown or were unwilling to countenance violence as a means of redress. In 1766, Samuel Chase became embroiled in a war of words with a number of Loyalist members of the Maryland political establishment in Annapolis. In an open letter dated July 18, 1766, Chase attacked Walter Dulany, George Steuart (1700–1784), John Brice (1705–1766), Michael MacNamara and others for publishing an article in the Maryland Gazette Extraordinary of June 19, 1766, in which Chase was accused of being: "a busy, reckless incendiary, a ringleader of mobs, a foul-mouthed and inflaming son of discord and faction, a common disturber of the public tranquility". In his response, Chase accused Steuart and the others of "vanity ... pride and arrogance", and of being brought to power by "proprietary influence, court favour, and the wealth and influence of the tools and favourites who infest this city." Such disputes would become increasingly bitter as war approached. In 1774, committees of correspondence sprung up throughout the colonies, offering support to Boston, Massachusetts, after the British closed the port and increased the occupying military force. Massachusetts had asked for a general meeting or Continental Congress to consider joint action by all the colonies. To forestall any such action, the royal governor of Maryland, Sir Robert Eden prorogued the Maryland colonial assembly on April 19, 1774. This was the last session of the colonial assembly ever held in Maryland. Painting by Francis Blackwell Mayer, 1896, depicting the burning of the Peggy Stewart at the Annapolis Tea Party, October 19, 1774. Despite such protests, and a growing sense that war was inevitable, Maryland still held back from full independence from Great Britain, and gave instructions to that effect to its delegates to the First Continental Congress which met in Philadelphia, Pennsylvania in September 1774. 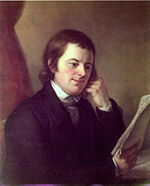 Thomas Johnson, Maryland's first elected governor under its 1776 Constitution. During this initial phase of the Revolutionary period, Maryland was governed by the Assembly of Freemen, an Assembly of the state's counties. The first convention lasted four days, from June 22 to June 25, 1774. All sixteen counties then existing were represented by a total of 92 members; Matthew Tilghman was elected chairman. The eighth session decided that the continuation of an ad-hoc government by the convention was not a good mechanism for all the concerns of the province. A more permanent and structured government was needed. So, on July 3, 1776, they resolved that a new convention be elected that would be responsible for drawing up their first state constitution, one that did not refer to parliament or the king, but would be a government "...of the people only." After they set dates and prepared notices to the counties they adjourned. On August 1, all freemen with property elected delegates for the last convention. The ninth and last convention was also known as the Constitutional Convention of 1776. They drafted a constitution, and when they adjourned on November 11, they would not meet again. The Conventions were replaced by the new state government which the Maryland Constitution of 1776 had established. Thomas Johnson became the state's first elected governor. Maryland declared independence from Britain in 1776, with Samuel Chase, William Paca, Thomas Stone, and Charles Carroll of Carrollton signing the Declaration of Independence for the colony. On March 1, 1781, the Articles of Confederation took effect with Maryland's ratification. The articles had initially been submitted to the states on November 17, 1777, but the ratification process dragged on for several years, stalled by an interstate quarrel over claims to uncolonized land in the west. 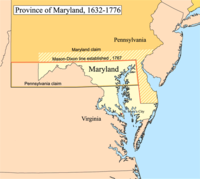 Maryland was the last hold-out; it refused to ratify until Virginia and New York agreed to rescind their claims to lands in what became the Northwest Territory. Maryland would later accept the United States Constitution more readily, ratifying it on April 28, 1788. The 1st Maryland Regiment holds the line at the Battle of Guilford Courthouse, March 15, 1781. Marylander John Hanson (1721–1783) was the first person to serve a full term as President of the Continental Congress under the Articles of Confederation. Although no major Battles of the American Revolutionary War occurred in Maryland, this did not prevent the state's soldiers from distinguishing themselves through their service. General George Washington was impressed with the Maryland regulars (the " Maryland Line") who fought in the Continental Army and, according to one tradition, this led him to bestow the name "Old Line State" on Maryland. Today, the Old Line State is one of Maryland's two official nicknames. Marylander John Hanson served as President of the Continental Congress from 1781 to 1782. Hanson was the first person to serve a full term as President of the Congress under the Articles of Confederation. From November 26, 1783, to June 3, 1784, Annapolis served as the United States capital and the Confederation Congress met in the Maryland State House. (Annapolis was a candidate to become the new nation's permanent capital before Washington, D.C. was built). It was in the old senate chamber  that George Washington resigned his commission as commander in chief of the Continental Army on December 23, 1783. It was also there that the Treaty of Paris, which ended the Revolutionary War, was ratified by Congress on January 14, 1784. During the war many Marylanders, such as Benedict Swingate Calvert, illegitimate son of the ruling Calvert family and a Judge of the Land Office, remained Loyal to the British Crown, and suffered the consequences. Calvert found himself on the losing side of the Revolutionary War, which would effectively end his political career. The Annapolis Convention of 1774 to 1776 would see the old Maryland elite overthrown. Men like Calvert, Governor Eden and George Steuart were all to lose their political power, and in many cases their land and wealth. British-American Black Loyalist foot soldiers. Slaves were promised freedom by the British in return for military service. ... I do require every Person capable of bearing Arms, to resort to His MAJESTY'S STANDARD, or be looked upon as Traitors to His MAJESTY'S Crown and Government, and thereby become liable to the Penalty the Law inflicts upon such Offenses; such as forfeiture of Life, confiscation of Lands, &. &. And I do hereby further declare all indented Servants, Negroes, or others, (appertaining to Rebels,) free that are able and willing to bear Arms, they joining His MAJESTY'S Troops as soon as may be, for the more speedily reducing this Colony to a proper Sense of their Duty, to His MAJESTY'S Crown and Dignity. In general though, the war left the institution of slavery largely unaffected, and the prosperous life of Maryland planters continued. The Official flag of the State of Maryland still retains the arms of the Calvert family, the Barons Baltimore. In 1783, Henry Harford, the last proprietarial governor of Maryland and the illegitimate son of Frederick Calvert, 6th Baron Baltimore, attempted to recover his estates in Maryland which had been confiscated during the American Revolution, where he was a witness to George Washington's resignation of command at Annapolis. He and Governor Eden were invited to stay at the home of Dr. Upton Scott and his nephew, Francis Scott Key. However, he had no success in retrieving his land, in spite of the fact that Charles Carroll of Carrollton and Samuel Chase argued in his favor. In 1786, the case was decided by the Maryland General Assembly. Although it passed in the House, the Senate unanimously rejected it. In their reasoning for this rejection, the Senate cited Henry's absence during the war, and his father Frederick's alienation of his subjects, as major factors. Returning to Britain, he claimed compensation through the English courts and was awarded £100,000. Some trace of the Calvert family's proprietarial rule in Maryland still remains. Frederick County, Maryland, is named after the last Baron Baltimore,  and the official flag of the State of Maryland, uniquely among the 50 states, bears witness to their family legacy. ^ Events that Changed America Through the Seventeenth Century by John E. Findling, Frank W. Thackeray, pp. 133–34. ^ Randall, Willard Sterne. George Washington a Life. New York: Henry Holt &, 1998. Print. ^ Breen, T. H. Tobacco Culture: the Mentality of the Great Tidewater Planters on the Eve of Revolution. Princeton, N.J.: Princeton UP, 1985. Print. ^ McClanahan, Brion T., p. 204, The Politically Incorrect Guide to the Founding Fathers. Retrieved November 2010. ^ Montgomery, Lori (March 14, 2000). "Two-Bit Identity Crisis; Imprint Befuddles the Free – Make That 'Old Line' – State". The Washington Post. gwpapers.virginia.edu. Archived from the original on June 3, 2010. Retrieved October 7, 2009. ^ "Lord Dunmore's Proclamation". Digital History. 2007-10-18. Archived from the original on 2008-04-22. Retrieved 2007-10-18. ^ Room, Adrian, p. 27, Dictionary of World Place Names Derived from British Names. Retrieved January 26, 2010. Frederick Calvert, 6th Lord Baltimore Retrieved January 26, 2010.